Well, this year four pots that were each bubbling away on their own resulted in some new books, all of which were published in just the past few months. But they’re each a different sort of book. The other two projects, both his own work, are collections of essays, one published by Equinox (in the UK) and the other by Walter de Gruyter (in Germany). “Early on, for what was probably a wide variety of reasons, I sort of just became an essayist,” he remarked, “and many of my own works are collections of pieces that I’ve written over the years — essays that I think have something in common.” The first of these two contains mainly practical pieces, on the profession, on teaching, etc., intended for an early career reader while the other further elaborates on arguments he’s advanced for some time, concerning the practical effects of naming something as religion. “I’m really quite pleased that a number of early career scholars were able to join in my Equinox book,” he added, referring to the 21 scholars whose commentaries on his own “Theses on Professionalization” were included in the book, thanks to Matt Sheedy‘s efforts to invite them and edit their pieces. His fourth book, which was co-edited with his longtime friend and collaborator, Willi Braun, is yet a different kind of book: a collection of interviews done by the late Jonathan Z. Smith. “It includes one of his unpublished essays too,” he added, “but is mainly a set of interviews that Smith did over the years, some already available in video format online, and some relatively unknown.” Suggesting that it might be a good place for newcomers to Smith’s work to start their readings (given the sometimes informal, even fun, tone of the interviews), McCutcheon said that this particular volume had been in the works for 4 or 5 years. “WIlli and I met with Jonathan in Chicago, to talk over the idea, several years ago, to make sure he was on board, but, as sometimes happens, it just took a few years to bring it all together.” Although Smith passed away shortly before it was published, McCutcheon commented on how pleased they were that Smith had been involved, noting that all of the royalties from its sales go to Smith’s estate. 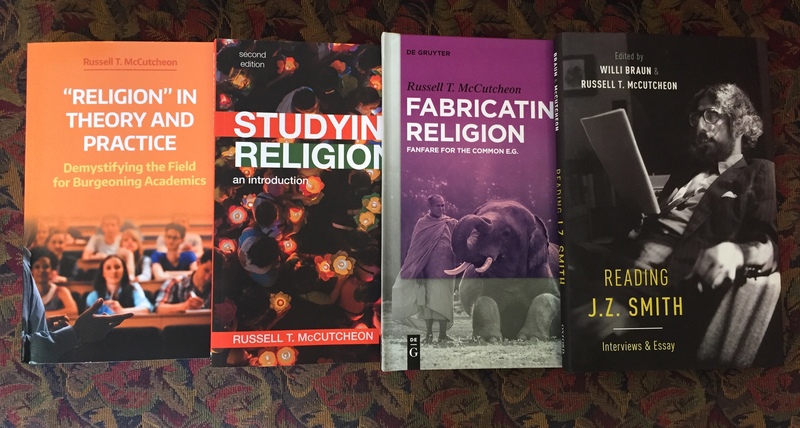 This entry was posted in Faculty Blog, Relevance of Humanities, Religion in Culture and tagged Andie Alexander, Essay Collections, Essays, Intro Book, Jonathan Z. Smith, Publication, Russell McCutcheon, Willi Braun by admin. Bookmark the permalink.